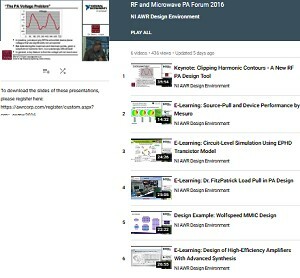 The presentations recorded at the third annual RF/Microwave Power Amplifier (PA) Forum during European Microwave Week 2016 (EuMW 2016), featuring both NI AWR Design Environment and partner solutions, are now available for viewing on the AWR.TV YouTube channel. The RF/ Microwave PA Forum playlist can be found on the AWR.TV YouTube channel. Since 1976, NI has made it possible for engineers and scientists to solve the world's greatest engineering challenges with powerful, flexible technology solutions that accelerate productivity and drive rapid innovation. Customers from a wide variety of industries–from healthcare to automotive and from consumer electronics to particle physics–use NI's integrated hardware and software platform to improve the world we live in.